What you really have to understand about colour genetics is the process of pigment type switching. A melanocyte can only ever produce eumelanin or pheomelanin at one time, never both types of pigment at once. To get both pigments into a single hair, the pigment cell has at one point to switch from the production of one pigment type to the other. Left to its own devices, a melanocyte will only produce pheomelanin. To make it produce eumelanin, a signal from outside of the cell is needed. The signal is given by α-MSH, the melanocyte stimulating hormone (there are three of them, α, β and γ, for our purposes, only α is of interest). It binds to a receptor in the plasma membrane of the melanocytes – once it gets activated by α-MSH, it gives the signal to the melanocyte to produce eumelanin. This receptor is best known as the melanocortin 1 receptor, the gene coding for it is the melanocortin 1 receptor gene, short Mc1r gene. We as dog people know it under a different name: Extension, our good, old E-locus. Depending on which alleles are present, this receptor can work excellently or not at all with a lot of graduation in between. A non-working Mc1-receptor simply lacks a place for α-MSH to bind to it, the melanocyte never gets the signal to produce eumelanin and just continues producing pheomelanin. A very active Mc1-receptor on the other hand gives α-MSH a chance to bind to it even in the presence of competition for the binding place. This competition is provided by the agouti signaling peptide, coded for by the agouti gene (ASIP), or A-locus. Whenever this peptide binds to the Mc1-receptor, the melanocyte produces pheomelanin. When you look at a dog that’s showing both yellow and black in its coat, you can see easily when and were either α-MSH or the agouti signaling peptide won the battle for the binding place. Yellow – agouti signaling peptide was the winner; black – α-MSH was the winner. The agouti gene exists in two different variants (or isoforms) – one that’s active dependent on the hair growth cycle (the hair cycle specific variant), and one that’s dependent on where it’s localized on the body (the ventral specific variant). The first one is responsible for banded hairs, the second one for yellow (red, white) undersides. Now, please don’t misunderstand: those two variants are not different alleles, both variants can be coded for by one and the same allele! 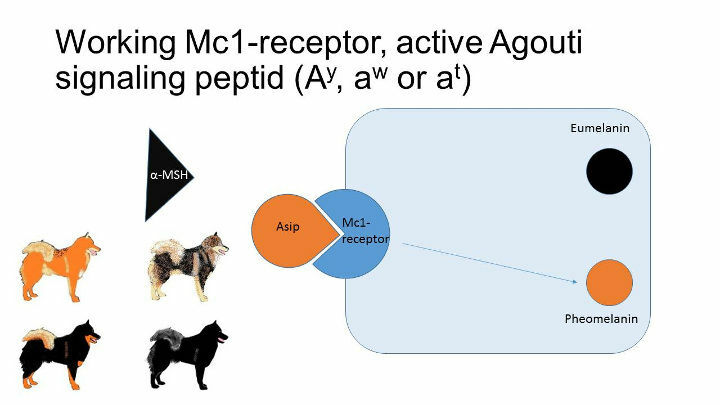 Like the Mc1-receptor, the agouti signaling peptide can be reduced or enhanced in its function. The Ay-allele codes for a very “strong” peptide that wins over α-MSH a lot more often than it would usually do, the a-allele on the other hand produces a non-working peptide that doesn’t bind at all to the Mc1-receptor. So, in a way, it’s wrong to say that the a/a genotype produces the black coat colour. The truce is, it simply can’t stop α-MSH from doing so! Respectively, the e/e-genotype doesn’t produce the yellow phenotype, it just fails at its job to relay alpha-MSH’s message to the melanocyte to do otherwise! In all of that, α-MSH is always present. Whenever it gets the chance, it will bind to the Mc1-receptor. 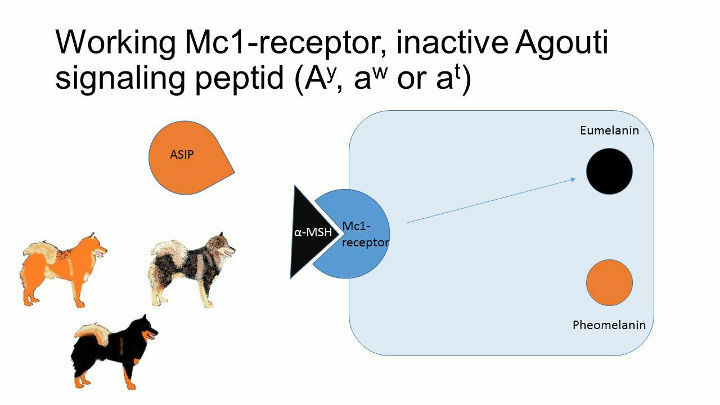 If it’s a “strong” receptor, α-MSH may bind more easily to it than the agouti signaling peptide, a “weak” receptor on the other hand makes it difficult for α-MSH; in this case the agouti signaling peptide has the advantage. 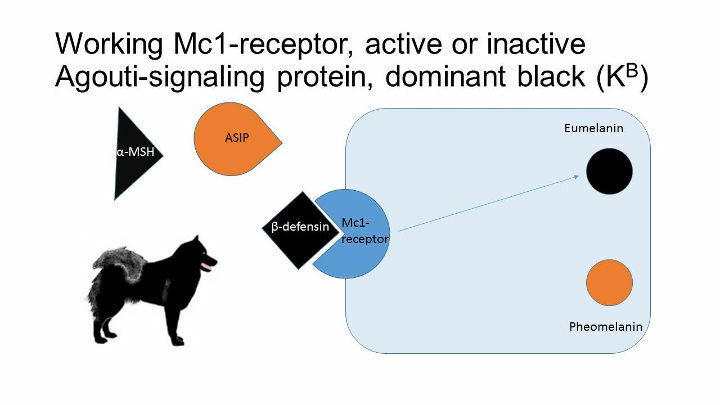 This explains, why there is always at least a little black present on a dog with a (rudimentary) working Mc1-receptor – even in the presence of Ay, there still is α-MSH competing (and occasionally winning) against it. Where are its best chances? Along the dorsal line, obviously. Why? I don’t know, the easiest explanation might be, that Mc1r, too, has different isoforms dependent on the localization over the body or is more active along the dorsal line. What you have to remember is this: the “stronger” the Mc1-receptor, the more eumelanin gets produced, the “weaker” the Mc1-receptor, the more pheomelanin. With the agouti signaling peptide, it’s the other way round – the “stronger”, the more pheomelanin, the weaker, the more eumelanin. This explains, why a combination of “weak” Mc1-alleles with “weak” Asip-alleles can have a very similar phenotype to the combination of “strong” Mc1-alleles with “strong” Asip-alleles. Think of the domino pattern in Salukis or Huskies and note the similarity to an agouti phenotype or sometimes even shaded sable in other breeds. Additionally, being homo- or heterozygous for the A-locus seems to make a difference – look at the Ay/at-sables or aw/a dogs (the latter being usually much darker than aw/aw or aw/at in several breeds I can think of). Likewise in the E-locus – different combinations of E-alleles produce different phenotypes and I include a lot of alleles here than are currently known. Wildtype markings, Urajiro, different melanistic mask alleles – they all wait to be discovered on a genetic level, but I’m very sure they’re simply alleles of the Mc1r-gene. In most species, the distribution of black versus yellow pigment is regulated by the interaction of those three players – Mc1r, Asip and α-MSH. The proverbial black sheep has its colour due to a dominant mutation on the Mc1r-gene; almost all species with a dominant black phenotype have it due to a mutation on Mc1r, making the receptor “stronger”, more “α-MSH-friendly”. Species were a recessive form of black occurs have it due to loss-of-function mutations on ASIP, horses being an example. Dogs being dogs, of course, weren’t satisfied with this system, they had to go and invent something to make things a little bit more interesting. 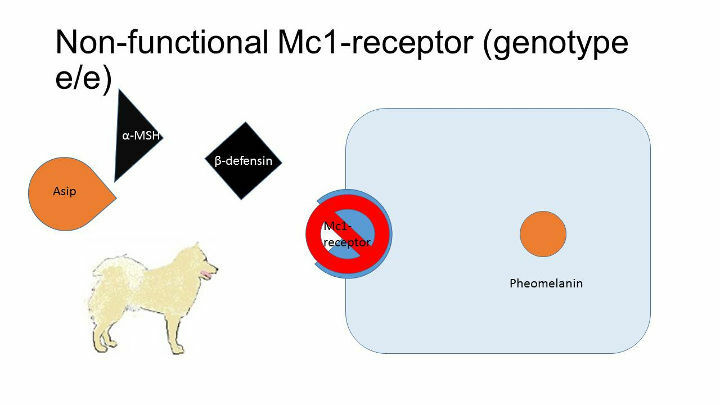 Enter CBD103, canine beta-defensin 103, better known to us as the K-locus. Originally employed in the unspecific immune system, a certain mutation made it forget about its actual purpose and made it chemically compatible to the Mc1-receptor. 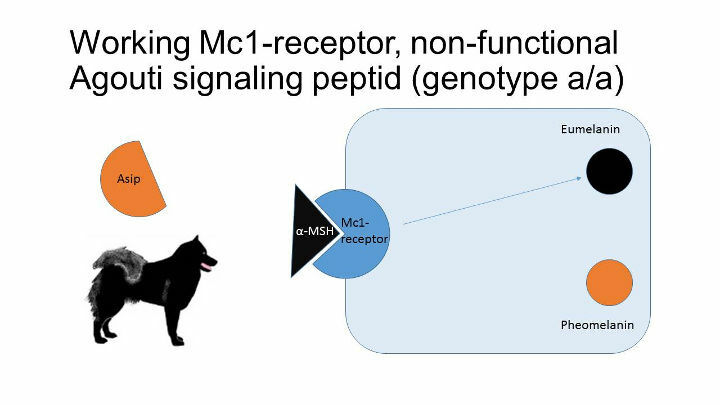 I’m not exactly sure whether it binds directly to the Mc1-receptor instead of α-MSH or makes it easier for alpha-MSH, even in the presence of the agouti signaling peptide, to bind to the receptor. The fact remains, that in dogs the dominant black phenotype has a different genetic built up than in all other species (so far, at least). The product of the KB-allele has to compete against the products of A-alleles, assisted or hindered by the “strength” of the Mc1-receptor, so that might explain the existence of “seal” dogs. Heute waren schon 36 Besucher (79 Hits) hier!